Driving down Morse Road, we came across a taco truck we hadn’t seen before. We stopped, and looked over the menu, which was small but listed a few things we hadn’t seen before. Most of what we were interested in wasn’t available, but a whole host of other unlisted items were. In discussing the menu with the woman in the window, I cobbled together a few words of high school Spanish. See seemed amused – maybe even impressed? – by this, which of course left me utterly charmed by her. Her husband, I assume, sensed that I didn’t understand a particular unlisted taco option, called picadillo, and said, ‘one moment, you try’. He turned around, worked a ball of masa between his hands, and pressed a fresh tortilla to get it started. While I awaited this taste, a small spry woman strode up and announced that if we wanted to order, we needed to ring the bell. I hadn’t noticed it, but yes, there was in fact a sizable bell somewhat reminiscent of the liberty bell just sitting there on the counter. I told her that we had ordered, which was sort of true, and that she could go ahead. She asserted that everything was good here, and when asked what she orders she said chicken tacos this time, quesadillas others. She said that she’s from Vietnam but that she loves Mexican food. She didn’t say that this was her taco truck, the one she relies on and feels fiercely loyal to, the one where she feels like she knows the owners better than they think she does. She didn’t have to. The picadillo taco arrived – ground beef, potatoes, carrots, cilantro, onion. A little spicy heat. It’s free, just try, they said. We did. Delicious. We ordered two more of them, plus one asada, one lengua, and three vegetable options – squash blossom, huitlacoche, and nopal. They had Squirt, which is rare and nostalgia inducing, so two Squirts, too. With her takeout order secured, the Vietnamese woman said ‘good talking to you’ and walked with her food into the beauty supply store next door. The tacos arrived neatly arranged on colorful plastic plates. When it’s 76 degrees and sunny and the taco truck provides street side chairs and tables, you sit there and you eat. As a known quantity to ravenous appetites, the picadillos disappeared first. A trio of extravagantly hued robes floated by, inhabited by Somali women with soft expressions and purposeful gaits. The asada and lengua were both solid examples of their kind, while the huitlacoche and nopal were only as good as something that comes from a can shipped from far away can be. The squash blossom taco was best, and seemed perfectly in keeping with the experience – bright, eclectic, unusual but accessible. Squash blossoms, yes, but among what amounted to a grilled succotash medley. It may not taste as good to you as it did to me at that precise moment, but it’ll still be very good. As was the traffic on Morse Road, at least if sitting in lunchtime gridlock is busy. It’s an oft-overlooked section of the corridor for many, but it is alive. Open Tuesday-Saturday 10am-10pm. Sundays at Rhodes Park. In preparation for our first Taco Truck Tour, we recently completed our annual survey of the trucks of the west side. This part of town had been fairly stable over the past 5 years, with relatively few trucks coming or going, but this year is different – we counted 5 trucks we haven’t been to before, and have reason to suspect there are at least a couple more. 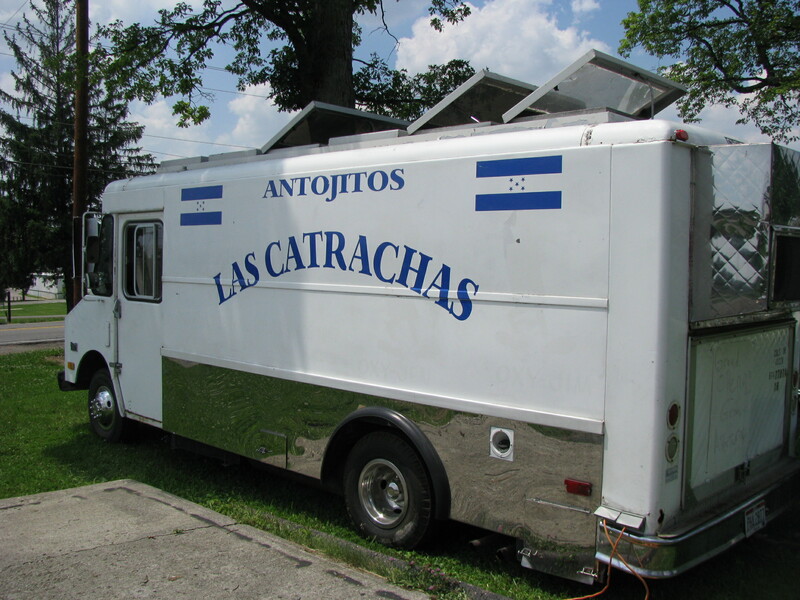 Yesterday we only had belly space to give to one truck, and that truck was Antojitos Jacky. 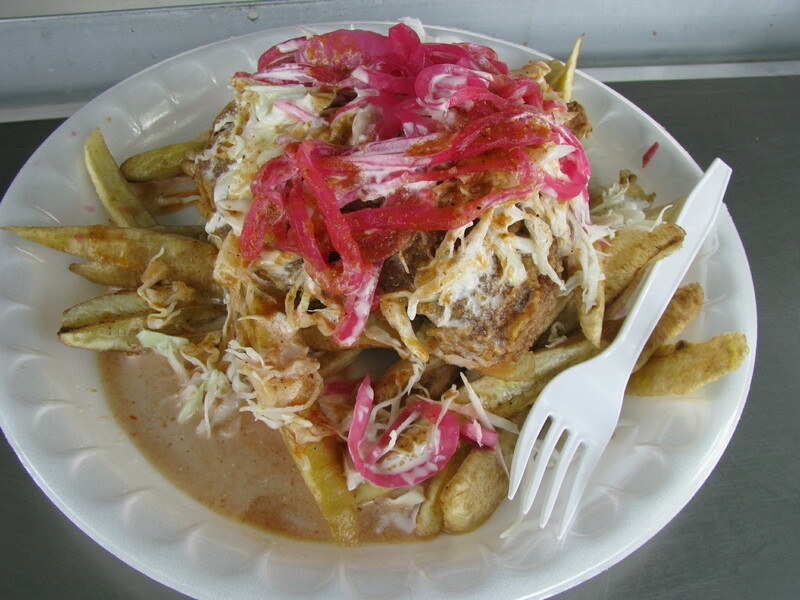 They carry the traditional quartet – tacos, burritos, quesadillas, and tortas – as well as preparations we more commonly associate with those sold at sporting events, such as fruit cups and chicharron preparado (pictured below). But hidden among the rest of the menu were a couple of curiosities – dorilocos and tostilocos. 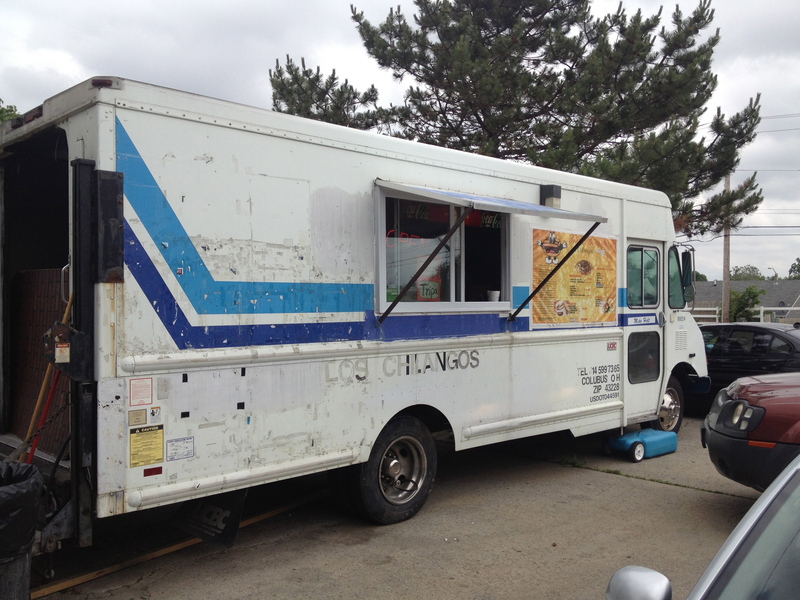 We inquired, the owner explained, and we grinned – they’re walking tacos, either with Doritos or tortilla chips. This is not what we expected. For those of you who haven’t encountered them, walking tacos amount to a sliced open single-serving bag of chips topped with any of a wide variety of either Mexican (or “Mexican”) ingredients. Nachos in a bag, basically, and apparently a popular fair food in the Midwest. Tortilla chips were sold out, so dorilicos it was. We ordered them topped with asada, shredded cabbage, diced cucumber, avocado, crema, a not-very-hot hot sauce, and ‘peanuts japones‘. Suffice it to say it was delicious, but the joy of eating was secondary to watching an avowed hater of all things junk foody scarfing it down like it was her last meal on earth. “Who would’ve thought cabbage would go with Doritos so well?”, she opined incredulously. It was a good point. 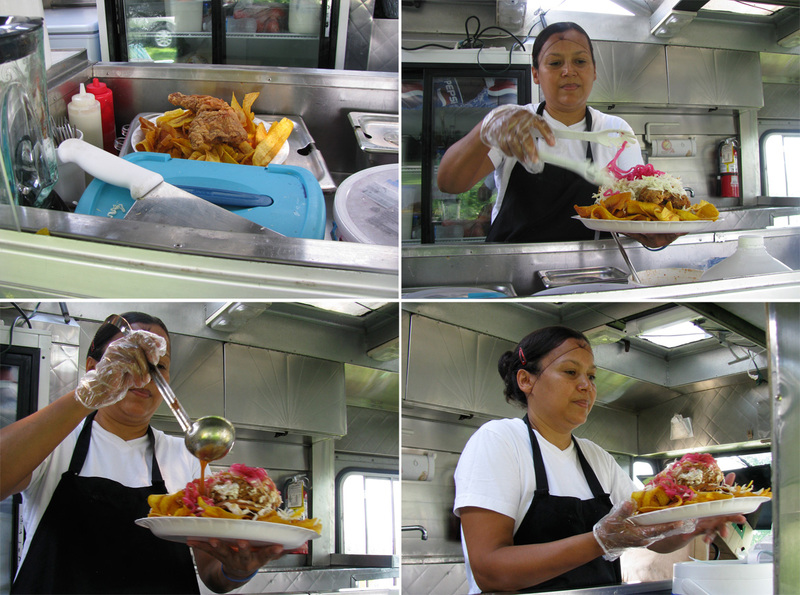 And there we have it – the true joy of the Columbus taco truck experience. Each untried truck is an opportunity to discover something new, to gamble on serendipity and win. We’re looking forward to exploring the rest of the newcomers, especially the one that’s Chucky themed (bonus points if you find it before we write about it). In the beginning, we had no idea if anyone would read this blog. 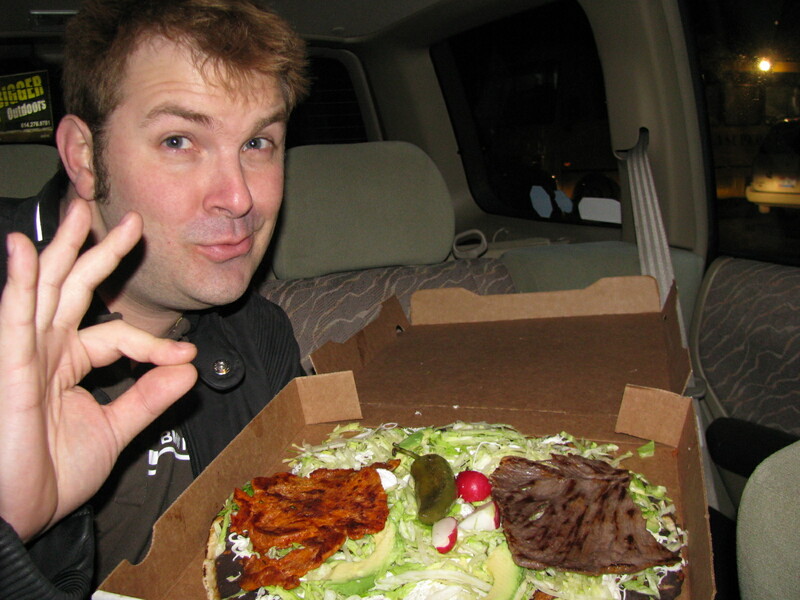 Mobile Mexican food – we knew we were enthusiastic about it, but would anyone care? To our shock and delight, they did. It’s our sense that the taco trucks in Columbus have, in the past four years, emerged from obscurity to become a point of pride for the city. They certainly have for us. In the mean time, we’ve seen two trucks graduate to bricks & mortar restaurants, and we’ve seen one of them ranked as serving one of the four best tacos in the US. And, we’ve seen the truck scene mature and, perhaps, reach a critical mass. The total number of them remains consistent, and change mostly comes in the form of trucks changing hands (though our most recent post, Los Sartenes, is a brand new debut). As such, activity on this site is less frenetic than it was at the beginning, but we want to reassure you – we do continue to monitor the goings on in the taco truck world, and are still dedicated to bringing you new content as it is made available. And, in the mean time, two thirds of the Taco Trucks Columbus team also run Columbus Food Adventures – our local food tour company. 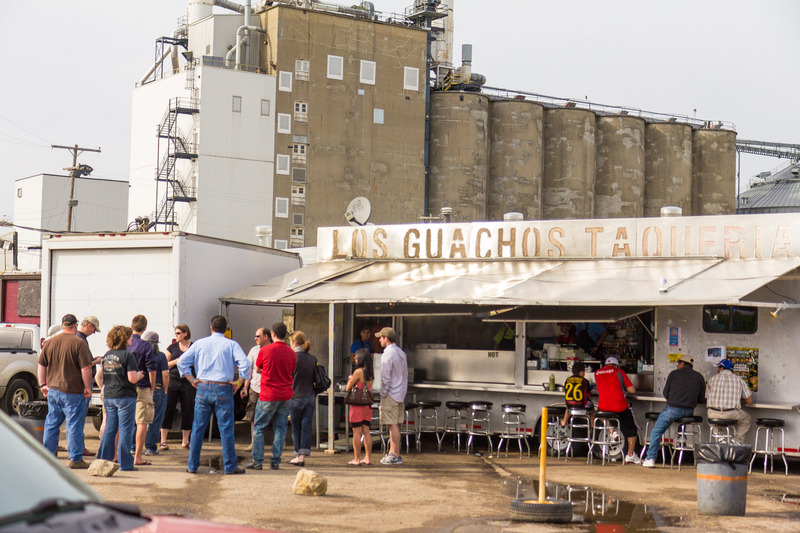 It was begun, in no small part, due to the desire we found among people to visit taco trucks, and our Taco Truck Tour is easily one of our most popular itineraries. 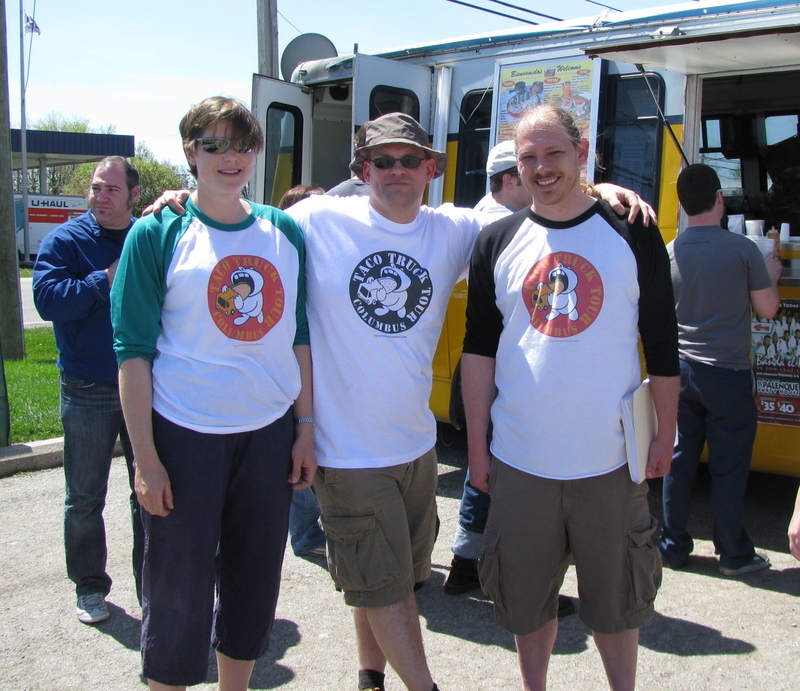 If you’d like to take a tour with the founders of Taco Trucks Columbus and taste our favorite dishes from our favorite trucks, we’d love to see you – tour tickets can be purchased at ColumbusFoodAdventures.com. Also, we’d encourage you to check out the preview of Transfusion, showing on Saturday, May 11th, at the The Gateway Film Center​ at 4:00 pm. It’s a documentary focusing on Columbus taco trucks, both in general and with a special focus on the plight of one local taco truck and the family they left behind in San Luis Potosi. We’ve seen an impressive extended trailer of the film and are definitely going to catch this showing! This month marks the third anniversary of Taco Trucks Columbus. We’re grateful in the extreme to all of you who have participated in this little endeavor of ours, be it as readers, truck-goers, commenters, or truck spotters. 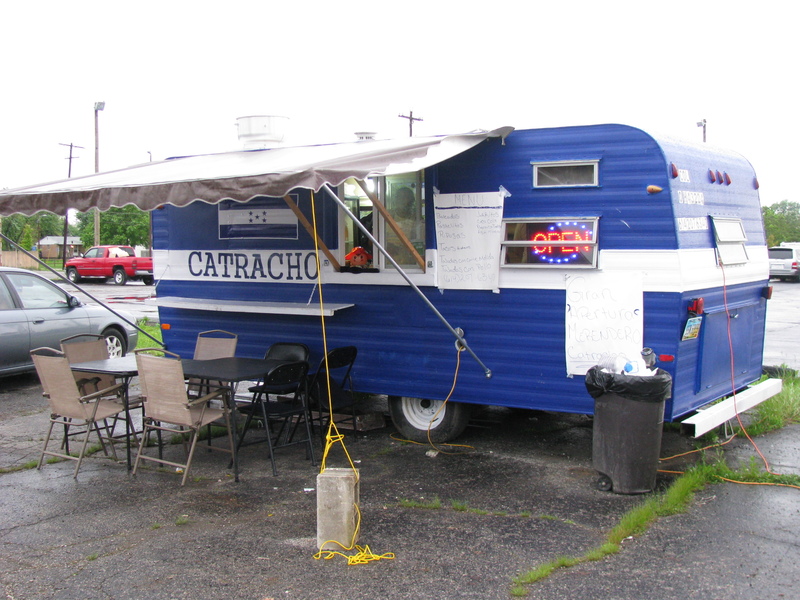 Taco Trucks Columbus began as an OSU geography class project for Bethia. The class was Latin American Geography, and the project required research to be done within Columbus. Jim had noticed a few taco trucks around town and had been eager to explore them, so with this idea the topic was settled – Bethia was off to collect data, with Jim and I accompanying as tag-along culinary curiosity seekers. We all enjoyed the taco truck food way more than any of us expected to, felt as though it filled a gaping hole for authentic Latino fare that was emphatically unfilled by more well known ‘Mexican’ food in Columbus, and wanted to let people know about it. Within a few months of beginning the blog, it was clear that taco trucks captured the imagination (and taste buds) of our increasingly large readership. The interest fueled our desire to continue with the project. Meet-ups for our blog readers were thrown, funds were raised for Latino charities, and a good time sure seemed to be had by all. We routinely took journalists and the curious among our friends on impromptu tours of the trucks. Taco trucking took us to a lot of areas in town we’d never been to before, and we couldn’t help but observe how many restaurants were in those areas. Moreover, we really couldn’t ignore the fact that few to none of them were getting any press… I mean, some of them had to be good, right? And, given their wide ethnic diversity, they had to expand upon the range of novel food offerings in town, no? With our curiosity pointed in that direction, alt.eats.columbus (as in, alternative to what’s been covered in Columbus) was begun. Our hunch was correct – there was a lot of great immigrant kitchen food to be discovered. Another unintended consequence of TTC was born of the popular conflation of taco trucks with food trucks in general. There was a presumption among many that we’d naturally be on top of developments among the rapidly growing non-Latino mobile food vendors. We really weren’t, at first, but once again it did seem to be something food-related that wasn’t adequately covered elsewhere. 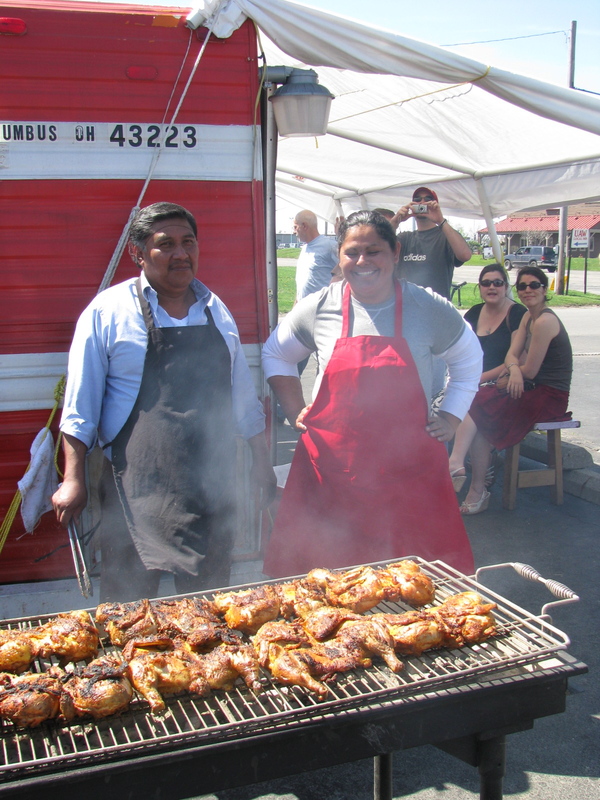 And that’s how Street Eats Columbus came to be. That is also when, I suppose, the unifying theme of our blog work became explicit – to discover and expose, to the extent we could, everything food-related in Columbus that wasn’t widely discovered and exposed otherwise. Which, when thought about in the abstract as such, could easily go in all sorts of different directions. Like, for example, Columbus Food Adventures. Having discovered so many food options that we believed to be of real culinary value and interest, Bethia and I came to believe that a food tour business would give us a new means of exposing people to the restaurants, foods, and people behind them that we’d become so passionate about. And, to be perfectly honest, it provided an opportunity to make a living off of something that, up to then, had been a compensation-free endeavor. 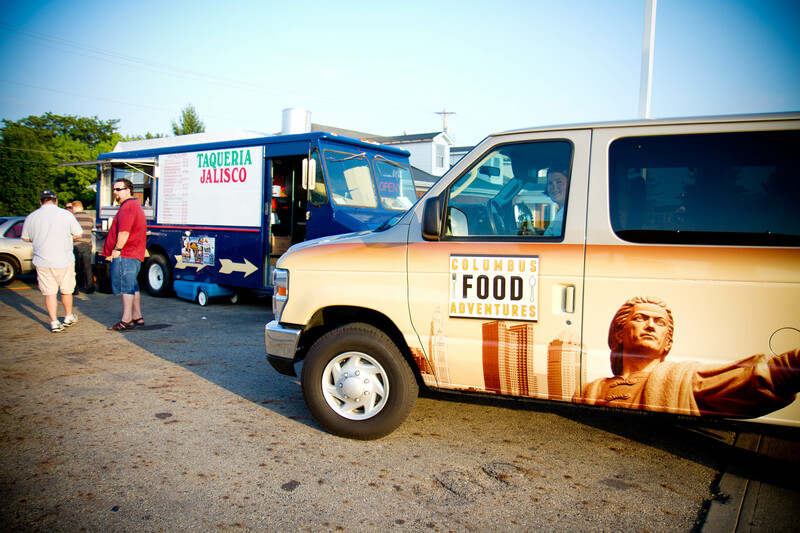 Both Taco Trucks Columbus and alt.eats.columbus have tours based upon them. Having served just shy of 3000 tour-goers since July of 2010, we’re solidly entrenched in this new and enjoyable career of ours. As we suggested previously, we never could’ve seen that coming! And then there’s Jim (aka CMH Gourmand) – a man who has forgotten more about Columbus’s food history than the rest of us will ever know. And, a man who, like many of us, had achieved a position of career comfort that kept the bills comfortably at bay while perhaps failing to make best use of his passions (this is certainly true with respect to his enthusiasm for all things food-related). That is, until last October, when he signed on with the ECDI as the coordinator of their Food Fort program. Now, Jim is helping to shepherd the next generation of mobile food vendors into existence, as well as participating in the team that is building out a new incubator kitchen and providing technical assistance to new and existing food ventures. Thanks, in no small part, to Jim’s tireless efforts, we expect this to be a huge year for ‘street eats’ in Columbus! The above amounts to a lot of reminiscing and ‘inside baseball’, but it’s a string of thoughts with a point: all of these somewhat improbable and positive developments are the result of your enthusiasm for our work, specifically starting with this blog. We thank you sincerely, we thank the all of the great folks that run the businesses that give us such great material to work with, and we look forward to sharing the upcoming taco truck season with you! 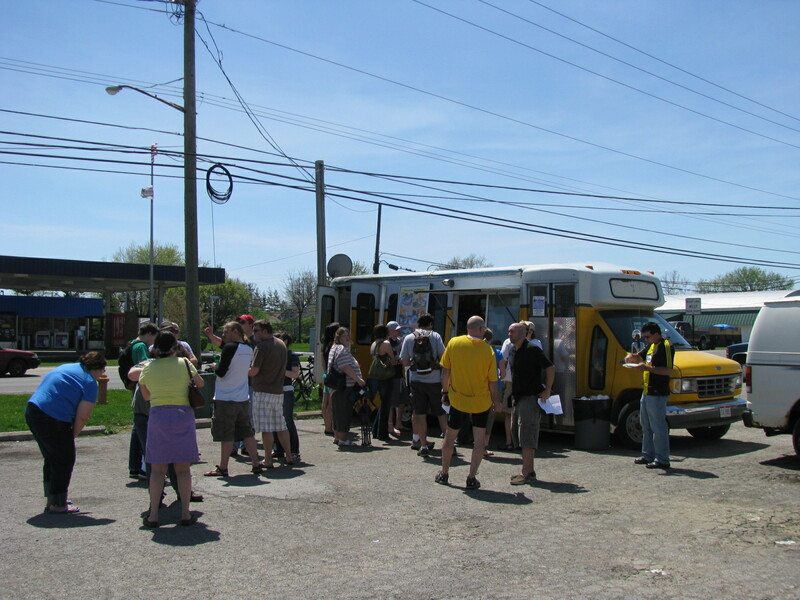 Columbus Food Adventures 2012 Taco Truck Tours start on April 1st. For more information or to purchase tickets online click here. Click here to map it! (update – it’s hard to spot from the road but it is behind the building in between La Bodega Market and Koki’s tortilleria). Wide menu with some unusual offerings. All tacos are $2). It’s always a pleasure to be able to share a good new taco truck with our readership, and El Halcon is good. It’s also brand-spankin’ new, and as clean and tidy as any truck we’ve ever seen. The owners started with an unmodified trailer and outfitted it with their own kitchen which, somewhat atypically, includes a full gas range in addition to the typical plancha (flat cooking surface). We’re eager to see what their plans are for that! Portions are generous. The tortillas for tacos are larger than the usual, and are filled with a surprisingly large quantity of meat. Three of their tacos would make for a full meal. We’ve never seen lengua served like this at a taco truck before (above, left) – literal slabs of it piled high. It was tender, juicy, and thoroughly flavorful. The carne asada, right, was also solid. Having passed our usual taco truck test order with flying colors, we moved into more adventurous territory. 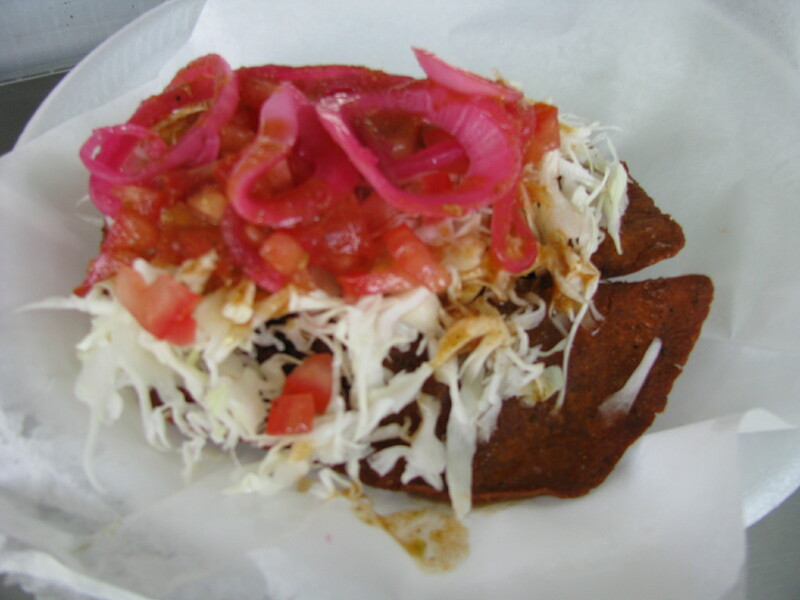 ‘Zazonada’ was a term we’d never come across, so a zazonada taco was next. Appearance-wise, it struck us as little more than carne asada tossed with a sauce, but the char of the beef mixed with the deeply umami quality of the sauce meant that the whole was resoundingly greater than the sum of its parts. We suspect there might have been some soy sauce in there somewhere, but whatever it was (and the owners aren’t telling)… it was delicious. As was their sope, which we tried with chorizo. The whole thing was good, but the masa base was exceptional – crispy on the bottom with a tender interior. The shell of their gordita was similarly satisfying. We tried their ham and cheese version, and thought it would be the perfect thing for someone who wasn’t exactly enthusiastic about latino flavors. You could imagine someone selling these as an alternative to the traditional grilled cheese and doing well. El Halcon also sells a wide variety of more traditionally filled gorditas. On a second tasting trip the focus was Tortas. The sandwiches are large, loaded down with the meat of your choice and plenty of toppings. 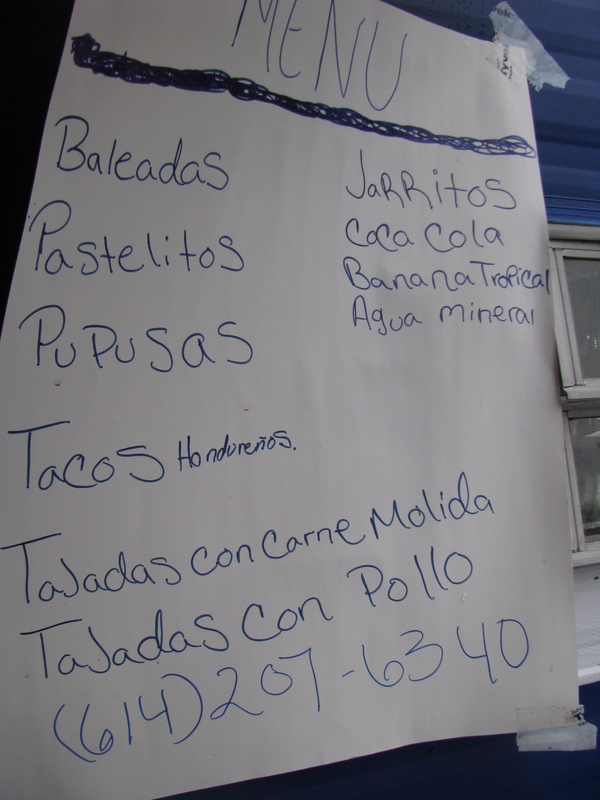 Having sampled Tortas from Geoegesville Road to Cleveland Ave, the El Halcon Torta rates at the top. Ready to take a trip to Broad & Harris yet? For more information about the food – our 2010 post is below. 3868 Sullivant Ave (parking lot of Country Food Store)(Verified August 2010). Note: Due to the ‘crossover’ nature of this particular food find (it’s a mobile food vendor – which is typically taco truck territory – but they’re selling some offerings that are entirely unlike anything we’ve covered yet on TTC), we are posting this write-up both here and on alt.eats.columbus. • We derive pleasure from the idea that our recommendations may help small business owners who have excellent (though perhaps unfamiliar) products to achieve much deserved success. • Pure unadulterated selfishness. Put simply, we want to be able to return to places like Las Catrachas again and again. Your patronage is requested for the purpose of keeping this new truck afloat through its infancy, thereby guaranteeing our continued, unfettered access. So please, go to Las Catrachas. Made to order, these brilliantly fresh cornmeal patties pleased like none we’ve had before, and were filled with a delicious mix of refried beans, mildly spiced chicken, and cheese. The curtido (cabbage slaw) was bright and refreshing, and the thin red sauce had deep savory undertones with just a hint of spicy heat. 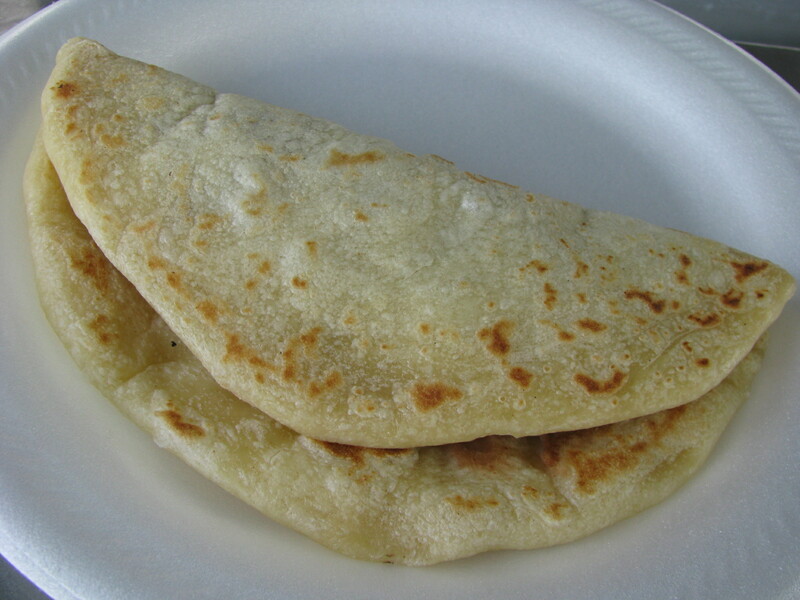 The baleada, a traditional Honduran snack, was similarly satisfying. While very similar to a taco in form and concept, this dish distinguishes itself with a light, thick, soft cornmeal shell containing your choice of cheese & refried beans, scrambled eggs, or carnitas & beans. We opted for the carnitas, and couldn’t have been happier. 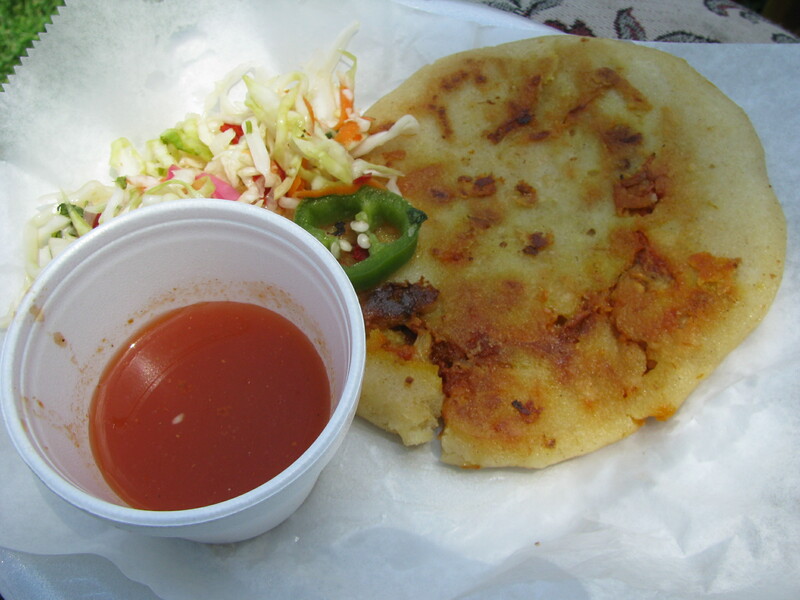 As with the pupusa, each bite exudes an ineffable freshness. This hot mess of a dish is called tajadas de guineo verde con pollo, or, in English, ‘french fried green bananas with chicken’. All of this was topped with pickled onions, cabbage, a sauce similar to the pupusa’s side sauce, and a rich, creamy dairy-based sauce. • The crispy french fried green bananas are way better than they might sound, don’t particularly taste strongly of banana, and were excellent when bathed in the mix of sauces that accumulated at the bottom of the plate. •The chicken is fried, and very skillfully fried at that. The included leg/thigh piece we sampled was, by itself, easily the best piece of fried chicken I’ve had in Columbus. A bold claim, perhaps, but I’m betting you’ll agree. •This chicken was even better when smothered in the creamy sauce… I think I detected a hint of buttermilk in there. Niiice. •The whole strange motley mish mash of a plate adds up to one hell of a counterintuitively cohesive and spectacularly satisfying dish. In fact, I’d wager that this dish has just the combination of oddball, inspired, and sublime that cult followings are made of. Finally, we tried the pastelitos de carne molida – essentially a ground beef & potato empanada topped with cabbage, tomatoes, and pickled onions. 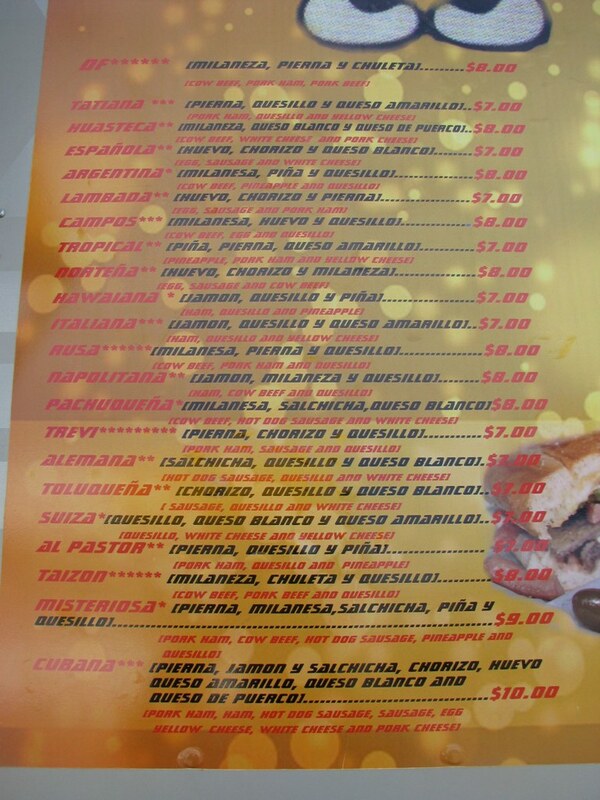 While carne molida translates roughly as ‘ground meat’, the meat in the pastelito seemed more like finely cubed beef. No problems there, though, as the pastelito was fried to a pleasing crispness, the carne/potato mix had a nice flavorful spiciness, and the whole package struck us as resembling an endearing Central American interpretation of an Indian samosa. Overall, our experience at Las Catrachas led all three of us to be infected with the kind of giddiness the food-obsessed get when challenged by the unfamiliar (who knew Hondurans ate fried chicken? Who would’ve thought to put it on a plate of banana fries and cover it with all sorts of stuff?!) and made utterly content by it. Please be aware that La Catrachas is only open from Friday through Sunday (though they suggested they might be open for Memorial Day Monday and perhaps some other holidays.) Vegetarians might find some happiness if they’re inclined to be lenient with some of the minor ingredients in the beans and cornmeal preparations – we can’t confirm the use of lard, but the likelihood is there. The staff is very friendly, and happy to work through any language difficulties. Open 10am – 10pm, 7 days a week. Update – Los Chilangos have a new location on Demorest Road. They are working towards opening a restaurant at that location and at the moment you can sit inside the restaurant while you eat. Once the kitchen is finished they will transition from the truck to the restaurant. They continue to make homemade tortillas (really good) and we’d recommend their lengua as well. 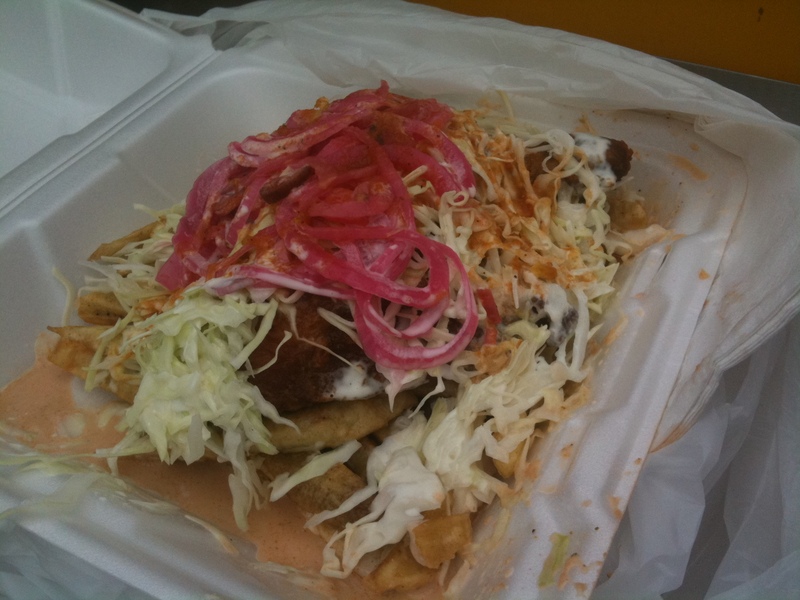 Los Chilangos marks our first find of the 2011 taco truck season, and it’s an interesting one. 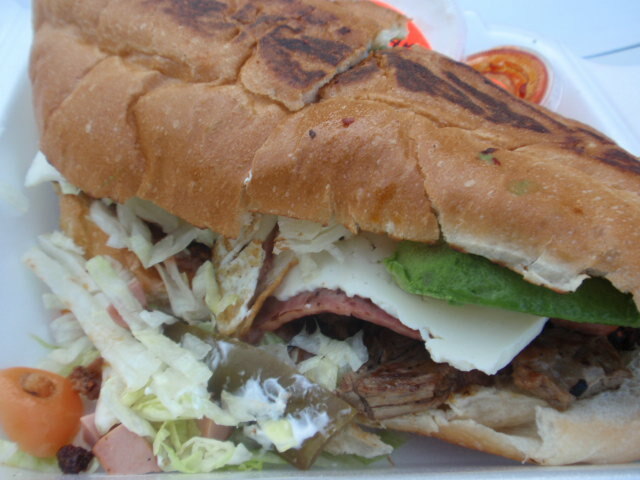 Tortas are their calling card, and they quickly distinguish themselves by having a selection of over 20 of them to choose from. They’re good, too. 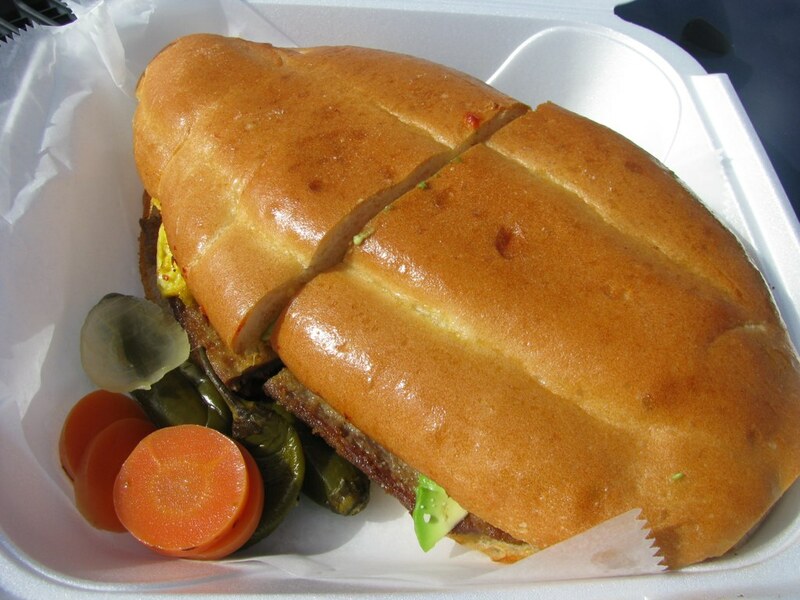 Pictured above is the ‘nortena’, a satisfying behemoth that includes egg, chorizo, and milaneza. Beyond tortas, the offerings are minimal – tacos, quesadillas, burritos, and huaraches round it out. Surprisingly, though, these were every bit as satisfying as the tortas (we’ve tried all save the burrito). Corn tortillas are made in-truck, make for a delicious differentiator, and are used not only with the tacos but also for the quesadillas. The thicker, also cornmeal-derived huarache base was also conspicuously handmade.